Physical Activity: Duration, Frequency, or Intensity? There is considerable interest in why the process of aging varies between individuals, both in humans and other animals. However, in animals, aging in terms of survival (demographic senescence) is understood in considerably more detail than in terms of declines in the body's functional capacity (functional senescence). Oxidative damage is probably an important component of the aging process in many species. Physical activity typically increases levels of oxidative stress, and many animals exhibit long and intense periods of active behavior. These observations raise a question that has not yet been addressed: while in humans, at least, activity is considered beneficial to health, could high intensity activity play a part in the rate that wild animals age? Studies to date suggest that increased “effort” can lead to reduced survival in free-living animals, but “effort” refers to different processes in different studies, and is rarely clarified or quantified. To understand the role of activity in functional senescence, studies must measure the detailed activity of free-ranging animals, possibly describing it in terms of intensity, frequency and duration, coupled with records of resultant physiological and DNA damage. “Comparative biology teaches us that reproduction is life's solution to the inevitability of death in the hostile environments of Earth” (Carnes, 2007). Time waits for no animal. Once mature, long-lived individuals of all species experience aging—a progressive decline in the functional capacity of their bodies, a loss of integration of homeostatic systems and an increased vulnerability to death (López-Otín et al., 2013; Li et al., 2015). For many years, wild animals were thought not to grow old, dying before senescence took hold (Medawar, 1952). More recently, however, focussed-studies on multiple taxa have shown otherwise (Nussey et al., 2013; Jones et al., 2014). In many species, individuals continue living well beyond their functional peaks (Froy et al., 2018), and often carry on reproducing albeit at a declining rate (Nussey et al., 2013; Jones et al., 2014). Aging in animals can be considered in terms of the decline in the body's performance (functional senescence) or the decline in fertility rate coupled with an increased risk of mortality (demographic senescence). Most work focusses on demographic senescence and we now know that there is a great diversity in trajectories of demographic senescence, not only between different species but also between individuals of a given species (Jones et al., 2008, 2014). In contrast, functional senescence, at least in wild animals, is less well studied. Research to date has shown age-specific changes in the immunity of wild animals (Cichon et al., 2003) and in certain other components of their physiology such as haematocrit (blood oxygen stores), hormones and metabolism (Massot et al., 2011; Elliott et al., 2014). In humans we know that physiological aging starts at different times in different individuals, and that it can occur at different rates even within the same person, depending on the tissue or physiological system examined (Sehl and Yates, 2001; Belsky et al., 2015). For example, the autonomic nervous and reproductive-endocrine systems senesce nearly four times faster than the CNS or musculoskeletal systems (Sehl and Yates, 2001). Similar detail at the physiological level is missing in wild animals (Reichard, 2016), but we know that some phenotypic, physiological, and behavioral traits can age asynchronously (Elliott et al., 2014; Hayward et al., 2015; Kervinen et al., 2015), in a way similar to in ourselves. At the same time, we have a comparatively detailed picture of the interconnected nature of aging between humans and the environment (Dato et al., 2017), and while similar evidence is accruing in wild animals (Nussey et al., 2008; Marshall et al., 2015), our understanding is far from complete (Hammers et al., 2015). There is a clear gap in our knowledge stemming from how the behavioral choices of animals influence their aging. Why should this be important? In this Review, we discuss whether the activities that animals carry out as part of their everyday lives could be a key component shaping their aging process. We discuss how activity could influence aging, what we are yet to understand about this process, and the key future directions that studies should take in order to drive forward the field of wild animal gerontology. Oxidative stress is one of the most important physiological costs of living and thus a key modulator of life-history trade-offs (Monaghan et al., 2009; Speakman and Garratt, 2013; Blount et al., 2015; Speakman et al., 2015). All aerobically respiring organisms produce reactive oxygen and nitrogen species (RS), which are highly reactive and can damage biomolecules including lipids, proteins, and DNA. The production of RS can be counter-balanced by various antioxidants (AO). Normally, cells are in a dynamic redox state whereby RS and AO are in so-called oxidative balance. When RS increases, there is a concomitant increase in the AO system to return the cells to oxidative equilibrium. An increase in RS production not matched by the AO response leads to an increase in oxidative damage and resulting oxidative stress (Costantini and Verhulst, 2009). There is considerable controversy as to the role of oxidative stress in aging, and research is needed to examine key mechanistic links between oxidative stress and senescence (Freitas and de Magalhães, 2011; Speakman et al., 2015). However, although we do not yet fully understand the functional links from production through to outcome for the whole organism (Speakman et al., 2015), oxidative stress is clearly a key underlying component of the aging process for many organisms. The primary biological process that results in the production of RS is an animal's basal metabolism. Two of the strongest covariates with between-species differences in lifespan are the amount of oxidative DNA damage (Adelman et al., 1988) and BMR (Hulbert et al., 2007; though see Munshi-South and Wilkinson, 2010). The pace of life theory postulates that species with a lower BMR mature at a later age and larger size, reproduce at slower rates, and have longer lifespans. In support of the pace of life theory, evolved changes in the BMR of a species occur in tandem with the evolution of different pace of life strategies (Auer et al., 2018), but lifespan is not simply a function of BMR, if it is a function of BMR at all (Speakman et al., 2002; Magalhães et al., 2007), and instead may be co-regulated or correlated with other components of an organism's life history (Glazier, 2014). Moreover, BMR is not an important driver of aging and lifespan at the within-species level (Rønning et al., 2014; Norin and Gamperl, 2017), and may even be beneficial (Speakman et al., 2002). For example, field voles Microtus agrestis kept at cooler temperatures and thus exhibiting a higher BMR did not have shorter lifespans (Selman et al., 2008), whilst between-individual natural variation in BMR had either no effect or a positive effect on longevity in zebra finches (Taeniopygia guttata; Rønning et al., 2014), lab mice (Mus musculus; Speakman et al., 2004) and Glanville fritillary butterflies (Melitaea cinxia; Niitepold and Hanski, 2012). BMR therefore is not the primary driver of individual variation in aging, probably because the body can largely remain in oxidative balance. Instead, variation in individual aging could be explained by sources of oxidative stress that overwhelm mechanisms of oxidative balance. Many organisms live active lives. During activity, metabolic rate increases to multiple times BMR (Piersma, 2010). A concomitant increase in oxidative stress and DNA damage under these conditions has been reported in a range of laboratory species (summarized by: Yap et al., 2017b) and in humans (Fisher-Wellman and Bloomer, 2009). Oxidative stress is a common consequence of physical activity. But does this mean that physical activity can shorten lifespan? After all, moderate physical activity is known to increase lifespan (e.g., lab rodents: Navarro et al., 2004; Boveris and Navarro, 2008; Vaanholt et al., 2010) and to offer protective benefits against oxidative damage (Radak et al., 2008). Potentially, the relationship between health and levels of physical activity is hormetic, whereby increases in physical activity lead to increases in physical or physiological benefits up to a threshold beyond which benefits then decline (Costantini et al., 2010; Pontzer, 2018; Figure 1A). Whilst evidence for hormetic responses are widespread in humans (Radak et al., 2008; though see Arem et al., 2015) and lab animals (Goto et al., 2007), evidence in wild animals is rarer, quite possibly because so few studies carry out suitable experiments. To date, studies have mainly investigated the extremes of the theoretical curve only, such as low activity vs. high activity (e.g., Aniagu et al., 2006). Combining studies that have investigated activity at low, intermediate and high levels suggests that low levels of voluntary activity have no effect on oxidative stress (Selman et al., 2002), intermediate levels of activity are associated with lower levels of oxidative stress and/or higher antioxidant protection (Costantini et al., 2008), and higher levels of activity have higher oxidative stress and lower antioxidant protection (Costantini et al., 2008). This is consistent with the hormetic response. There is a critical need for more studies, and the testing of a fuller range of activity levels, to understand how commonly the health effects of activity are hormetic. The impact of increasing activity levels on health will no doubt vary between species and contexts. Knowing at what point exercise may start to negatively impact health is a challenge; for example, it is possible that organisms carrying out sustained exercise below their energetic ceiling (i.e., <7 x resting metabolic rate: Hammond and Diamond, 1997), may not suffer obvious costs (e.g., Welcker et al., 2010). Only when organisms exercise above this ceiling, may negative impacts on health be apparent (Pontzer, 2018) and it is not clear that dose-dependent studies of human mortality capture this (Arem et al., 2015). 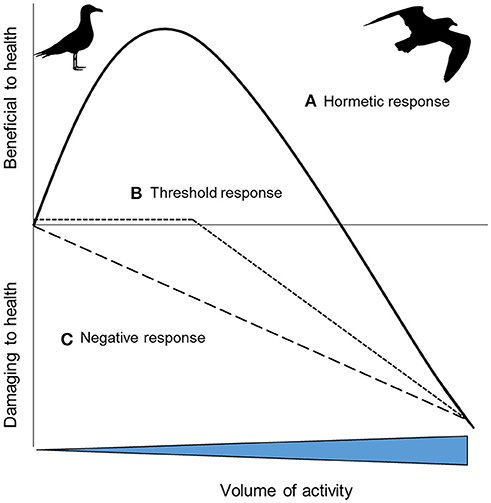 Furthermore, while in some cases the hormetic response may be apparent, in other species, increasing activity levels may have no effect on health until a threshold beyond which this increase becomes deleterious (Figure 1B). In other cases, perhaps simply the greater the activity level the greater the negative impact on health (Figure 1C). The shape of the response in humans can change both with physical training and antioxidant intake (Radak et al., 2017; Pontzer, 2018). For example, training can increase the level of exercise required before it becomes damaging or minimizes the oxidative stress damage (Radak et al., 2017). Similarly, experimental work in lab animals shows that training can decrease oxidative stress (Larcombe et al., 2010). In the wild, migrating birds may have higher intakes of dietary antioxidants, which could offer a protective benefit during long distance flight by countering increased RS production (Cooper-Mullin and McWilliams, 2016). The implications of these findings for the importance of animal exercise (Halsey, 2016), and exercise ecology (van Dijk and Matson, 2016), needs further exploration. Figure 1. Hypothetical health outcomes as a result of increasing volumes of activity: (A) a hormetic response where increasing activity provides initial health benefits, before then having an increasingly negative impact; (B) increasing activity has no or little impact on health up to a threshold, after which it becomes progressively more deleterious; (C) the impacts on health of increasing activity are progressively more deleterious [inspired by 43]. Despite reviews on humans (Powers et al., 2011) and examples from animal laboratory models (Yap et al., 2017b), as yet no studies have summarized broadly whether physical activity causes oxidative stress and DNA damage in wild animals either in the lab or wild. To date, such studies on wild animals have manipulated the “effort” they exhibit, an ill-defined term often used in the literature to allude to investment (physical and/or physiological) in some activity. To understand how manipulated changes in “effort” influence oxidative stress biomarkers and levels of DNA damage, we collated studies found in the literature (N = 15). 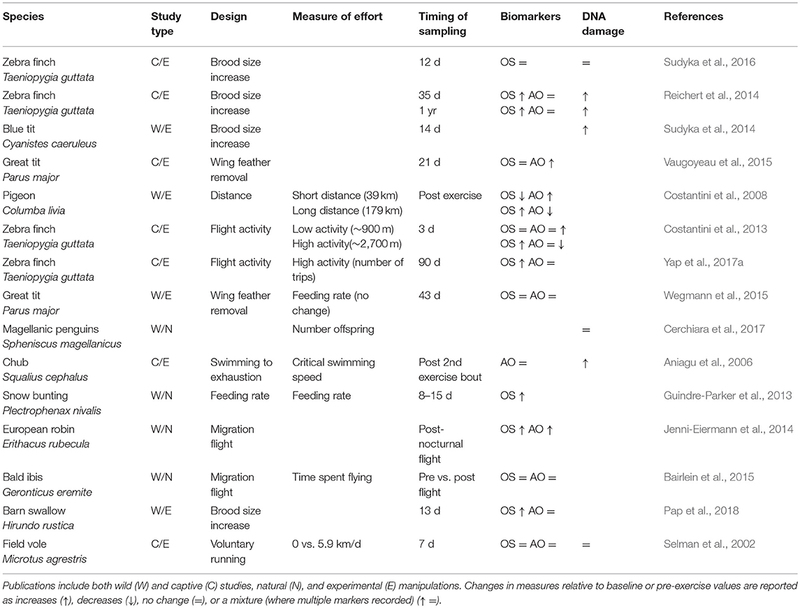 We found that in about half of studies, physical activity such as long distance flight or raising offspring was found to cause increases in oxidative stress (7/13 studies) and DNA damage (3/6 studies: Table 1). Moreover, increases in DNA damage were most evident when physical activity was considered to be high; where activity levels were classified as “low” or “voluntary,” there was no effect on oxidative stress or DNA damage (Table 1). Table 1. Published animal studies that assess “effort” and its impact on oxidative stress (OS), antioxidant biomarkers (AO), and DNA damage (telomere length, comet assays). Many wild-based studies manipulate “effort” by increasing brood or litter sizes and there is mixed evidence to support the contention that this leads to reduced survival—a measure of aging (Santos and Nakagawa, 2012). For example, Golet et al. (1998) reported that 29% (7/24) of studies manipulating clutch size negatively affected adult survival, whilst a study on jackdaws Corvus monedula showed that experimentally increased clutch sizes were associated with a decrease in long-term survival rates (Boonekamp et al., 2014). Unfortunately, few studies quantify the “effort” of the animals, for example in terms of their energy expenditure, and so are unable to show a link between effort and measures of senescence such as reduced survivability (though see: Daan et al., 1996). Moreover, there is only one study (and it is on captive animals—zebra finches), that includes measures of oxidative stress, DNA damage and survival (Sudyka et al., 2016). Hence, studies published so far investigating activity correlates of wild animal senescence have failed to combine all the following crucial elements: quantified physical activity, physiological and DNA damage, and measures of functional or demographic senescence. Athletes can run for 100 m considerably faster than they can run a mile. The basic physiology underlying this phenomenon is that short-burst exercise employs ATP and phosphocreatine to generate energy anaerobically—instant energy stores that deplete over a matter of seconds—while longer-term exercise must also employ lactic acid and electron-transport phosphorylation aerobically (Thompson, 2017). There are analogies to short burst and long endurance activity in animal ecology (Killen et al., 2017). Barnacle geese Branta leucopsis make migratory flights lasting around 60 h in total during which their heart rates are ~60% maximum (Butler et al., 1998), representing moderate exercise of long duration. In contrast, activities such as flight take-off, predator avoidance, mating displays and active predation typically involve rates of energy expenditure at least several-fold that at rest (Vehrencamp et al., 1989; Green et al., 2009; Lane et al., 2010; Soulsbury, 2019), and can only be performed for short periods (Piersma, 2010). Exercise can be broadly characterized by three interacting components: (1) Intensity characterizes the percentage of oxygen consumption rate (VO2) or heart rate relative to that at peak power output. In humans, high-intensity exercise is typically characterized as including bouts at 64–90% VO2max or 77–95% HRmax (Pollock et al., 1998). (2) Duration refers specifically to time spent carrying out the exercise, and (3) Frequency refers to the number of bouts of that exercise conducted. Thus the product of duration, frequency, and intensity in theory represents the overall volume of activity undertaken. We know that in isolation, increased duration (Bloomer et al., 2007), intensity (Wadley et al., 2016) and frequency (humans: Tanimura et al., 2010; dogs: Hinchcliff et al., 2000) of activity leads to increased oxidative stress. Furthermore, we know that in humans at least, oxidative stress is higher during anaerobic than aerobic exercise when conducted at similar intensities and duration (Bloomer et al., 2005). Therefore, activities that are of high intensity and anaerobic are quite possibly more immediately physiologically damaging than lower-intensity aerobic activities, perhaps even if the latter are of longer duration. For example, frequent and intense feeding activity by a passerine bird may be more costly to an individual than longer but less intense commuting flights between a foraging area and its nest, even if the volume of activity represented by the two activities is similar. With advances in data loggers to characterize animal activity, it is becoming progressively more feasible to quantify the composite parts of animal activities, in turn making it possible to relate the duration, intensity, and frequency of each part to both the energy costs and physiological costs of behavior. There is a growing awareness that the active behaviors animals perform in their daily lives may come with short-term and sometimes also long-term physiological costs, increasing oxidative stress (Costantini et al., 2008), DNA damage (Aniagu et al., 2006) and in some case reducing survival (Daan et al., 1996). However, there is a gap in our knowledge about which components of these activities are most influential in driving senescence and under what circumstances this influence is greatest. To our knowledge, no studies of wild animals have yet combined a detailed quantification of their physical activity and measurements of the resultant physiological costs (immunity, OS, DNA damage, and physiological homeostasis), particularly during critical periods when physical activity may be heightened such as reproductive events or migration. An important aspect of attending to this knowledge gap will be the quantification of “effort”. Furthermore, while most work to date investigating how activity affects aging has focussed on oxidative stress, physiological systems are highly interconnected and physical activity is likely to impact other biological processes such as the immune system, and hypothalamus-pituitary-adrenal axis (Eikenaar et al., 2018; Pontzer, 2018; sensu exercise immunology: van Dijk and Matson, 2016), which may also be associated with aging (Jurk et al., 2014). Individual-based, long-term studies provide excellent opportunities to address a number of eco-evolutionary questions (Clutton-Brock and Sheldon, 2010), including how activity and exercise impact aging. A first step for example, could be to quantify exercise and physiological markers during the mating season of polygynous species such as red deer Cervus elephaus or black grouse Lyrurus tetrix, across multiple breeding seasons. This could prove insightful in describing differing rates of senescence between individuals, as indicated by, for instance, declining home range sizes (Froy et al., 2018). With the right techniques, there is huge potential in existing study systems to investigate the impacts of activity on animal senescence. Thank you to Drs. Harry Marshall and Daniel Brayson for providing comments on a manuscript draft. Hammond, K. A., and Diamond, J. (1997). Maximal sustained energy budgets in humans and animals. Nature 386:457. Medawar, P. B. (1952). An Unsolved Problem of Biology. London: H.K. Lewis and Co.
Pollock, M. L., Gaesser, G. A., Butcher, J. D., Després, J. P., Dishman, R. K., Franklin, B. A., et al. (1998). ACSM position stand: the recommended quantity and quality of exercise for developing and maintaining cardiorespiratory and muscular fitness, and flexibility in healthy adults. Med Sci Sports Exerc, 30, 975–991. Vehrencamp, S. L., Bradbury, J. W., and Gibson, R. M. (1989). The energetic cost of display in male sage grouse. Anim. Behav. 38, 885–896. Copyright © 2018 Soulsbury and Halsey. This is an open-access article distributed under the terms of the Creative Commons Attribution License (CC BY). The use, distribution or reproduction in other forums is permitted, provided the original author(s) and the copyright owner(s) are credited and that the original publication in this journal is cited, in accordance with accepted academic practice. No use, distribution or reproduction is permitted which does not comply with these terms.